Before the two melded, HMC was not planning on going racing in 2009 due to economy and cutbacks in racing budgets at KTM. HMC still retained the very same bikes that earned HMC the 2008 450 supermoto championship and it seemed like a no-brainer once the two teamed up. 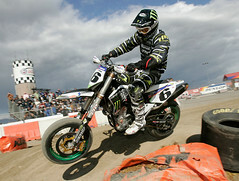 With help from Monster Energy, Team Monster Energy HMC Burkhart Racing KTM was formed. 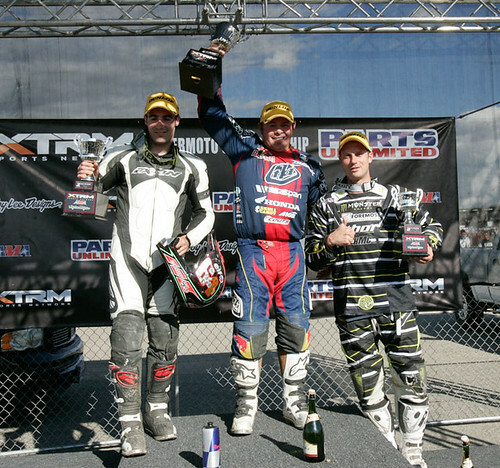 The team made the trek from Wisconsin to California for the opening round of the 2009 XTRM AMA Pro Supermoto Championship after only a short time to prepare for the season. With the talents of Burkhart and the precisionally-tuned Uli Toporsch-prepped HMC KTM, it made for a lethal cocktail going into the opening round. Weather was a factor come race day and Mother Nature let loose and started to rain on the parade. As the day wore on, the sky started to clear up and the track started to dry out during timed qualifying. As expected Burkhart put in the best time and took pole for the main over Jeff Ward and Burkhart’s former teammate, Brandon Currie. In the main event, Wardy bested Burkhart at the start of the race but it was clear early on that Burkhart was on it. It didn’t take very long to make a pass and work his way into the lead. Ward was not about to just give up and stayed fairly close to Burkhart’s tail, or at least close enough to regain the lead if a mistake was made. From there it looked like the making of a textbook victory. However it was a little too early to celebrate as Burkhart made a small mistake and ended up going down in a fairly slow-speed turn. Falling back in the pack, it was time to charge the afterburners and gain as many points as possible at the checkered flag. Soldiering on, Burkhart put his head down and powered through the pack picking off positions. 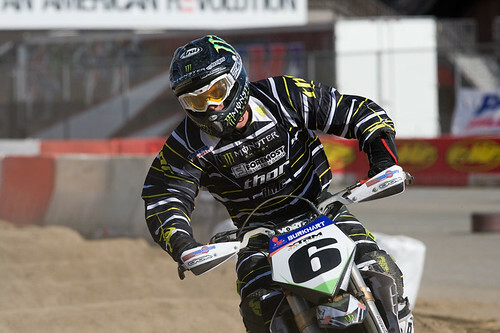 Burkhart was by far the fastest rider on the track but also one of the most unlucky after going down in the lead. 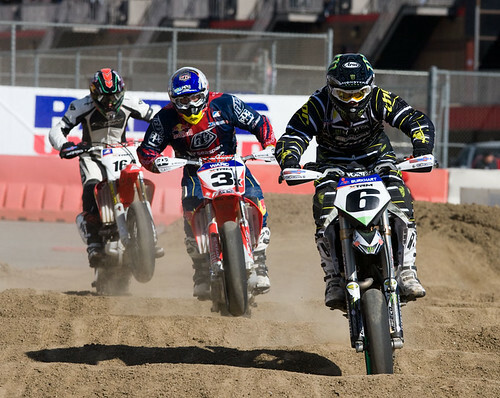 By the time he made his way to third, the 20-lap main event was at a close. Burkhart is right there in the point chase and very much a contender for the 2009 number-one plate. The goal is for Burkhart to re-capture the title he earned in 2007 and for HMC to earn back-to-back titles. Look for Team Monster Energy HMC Burkhart Racing KTM at round two of the series on May 16-17 at Infineon Raceway in Sonoma, Calif.